As I came upon the Zooniverse website, I discovered Asteroid Zoo. This project aims to explain asteroids, which are small rocky bodies that orbit the Sun. This project provides a basic introduction to asteroids, such as the classification of asteroids, but more importantly, enables the search for new asteroids. In fact, astronomers are detecting more and more asteroids every year. As can be seen from the graph, the year appears on the X-axis and the number of new Near-Earth asteroids detected is displayed on the Y-axis. The number of detected Near Earth Objects have skyrocketed every year since 2000. In 2000 there were roughly twenty however, in 2015, there was roughly 190 probably because of the advancement of technology over the years. You may ask yourself, why detect asteroids? What’s so important about discovering irregularly shaped rocks? But I’m here to explain the importance of asteroids. Astronomers have found asteroids quite intriguing and important because of all the information the asteroids reveal about the solar system. The deputy principal investigator for NASA’s DAWN mission, Carol Raymond, said “The materials in asteroids represent the building blocks of the planets. ” I agree with Carol because asteroids are the earliest remains of the formation of the Solar System. They are the basic leftovers debris from the Solar System. They could potentially reveal valuable information about the emergence of the Earth or other planets. Besides revealing important information, asteroids could be corralled and mined to provide an abundant supply of raw materials. Asteroids have been known to have Platinum Group Metals, which are some of the rarest and most valuable elements. These elements are found in the center of the Earth and cannot naturally grow in the Earth’s crust. In other words, these elements will most likely not be found in the Earth. Asteroids should been mined for their resources to address one of the Earth’s main issues, which is resource scarcity. Not only would the mining provide the Earth with resources, but it would help reduce the exploitation of Earth resources. The demand for asteroid material can lead to a resource driven economic expansionism, which can lead to the development of new innovations. Lastly, determining the location of asteroids is very crucial for our survival. There are approximately 10,000 Near-Earth Objects (NEOs). It is possible that one day, one of these 10,000 asteroids could enter the earth’s orbit and could potentially strike the Earth, killing nearly all of the species on Earth. Recently in Chelyabinsk, Russia on February 15, 2013, an asteroid roughly 17 meters in diameter and traveling at 42,000 mph detonated in midair. The explosions released energy equivalent to 500 kilotons of TNT. The explosions injured 1,500 people and damaged property. Some people experienced retinal and skin burns. This is why determining the location of asteroids is very important, to prevent the human race from suffering the same fate as the dinosaurs. Now there is no need to worry. The odds of an asteroids striking the Earth are slim. However, if an asteroid is headed our way, we need to be aware of the asteroids. To sum it up, asteroids play an essential role in the survival of the human race. By continuing to use telescopes to look out for NEOs, this will help us avoid an asteroid collision with the Earth. Asteroids could potentially reveal more information about the formation of our Solar System. Plus, people could take advantage of the surplus amounts of asteroids to mine for raw and scarce metals. “The Asteroid Hunters.” Popular Mechanics. 2015. Web. 10 Mar. 2016. “5 Reasons to Care About Asteroids.” Space.com. Web. 10 Mar. 2016. Citizen science projects are projects that the public can get involved with on various topics ranging from humanities to astronomy. Zooniverse, which is an organization that offers various citizen science projects, has launched a new project called Disk Detective. 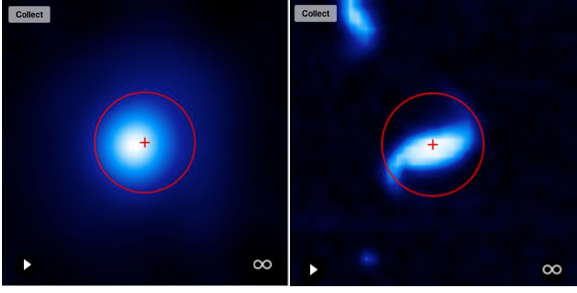 In Disk Detective, users search for disks of dusty material around stars. 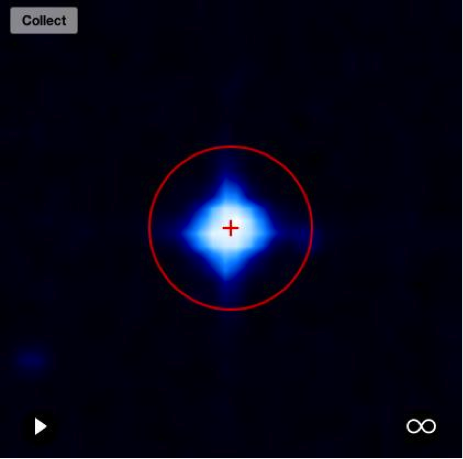 When looking at a star in infrared, which is a different wavelength of light than the light humans are able to see in, scientists may be able to see a disk orbiting around them. Disks are made of gas, dust, and debris that exist as a circular shape in orbit around a star and were formed at the star’s birth. 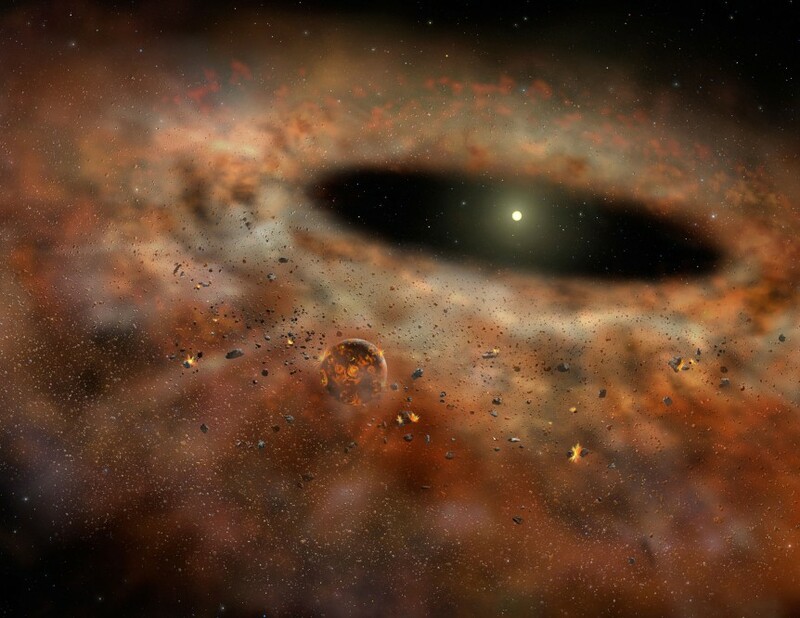 There are two forms of disks that orbit around different stars: debris disks and YSO disks. The stars that debris disks orbit around are 5 million years old or older with the disks being mainly composed of rock and ice. YSO, short for Young Stellar Object, are young stars typically found in clusters and are about less than 5 million years old. Unlike debris disks, YSO disks are instead mostly made of gas similar to what makes up gas giant planets. YSO disks can lead to the emergence of a solar system while debris disks contain remnants of material that helped form its solar system. The object on the left is a candidate star with a disk observed in longer wavelength of infrared. The object on the right is the same candidate star observed in optical light, thus showing more defined characteristics of the star. The object on the left is a candidate star with a disk observed in longer wavelength of infrared. The object on the right is the same candidate object but observed in optical light, thus revealing that the object is a galaxy and not a star! The public can get involved in Disk Detective by going to diskdetective.org and searching for stars with potential solar systems. I’ll continue my adventures in Disk Detective and report back any new findings. Until then, see you! Why not go to an exoplanet? An exoplanet is not just a planet outside of our Solar System, but it’s a planet that holds new and debateable discoveries waiting to be found. Although we cannot directly view these planets, scientists infer that an exoplanet is there based on inductive reasoning such as the fact that they are able to detect shifts in the light coming from a star if there’s a planet orbiting it. If we can conclude that these exoplanets exist, why not design a mission for astronauts to travel there? 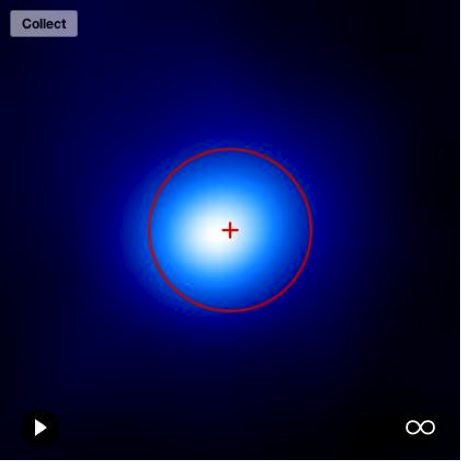 If we can infer that they are there, what’s stopping us from further exploring an exoplanet? An exoplanet is a planet outside of our Solar System. The nearest exoplanet is approximately 4.42 light years away, 26 trillion miles from Earth, which is nearly 10,000 thousand times the distance from Pluto to the Sun. If we are able to go at the speed of light, 3.0 x 10^8, then this would only take us 4.42 years to get there. However, the current technology is only able to go 20,000 miles per hour, so it would take 142,000 years to reach the nearest exoplanet to Earth. Scientists have not yet developed an aircraft that has been able to even come close to traveling at the speed of light. This trip would require generations of people to live in space because of how long it will take, and we don’t have that many people that are willing to live their full lives in space. Think about the fact that living here on Earth will be nothing like living in space for your entire life. When going to space, one needs to carry light because the more weight that we put inside of the aircraft, the more energy needed to actually move the aircraft. We don’t need a lot of fuel to travel, but we do need it to actually get to the exoplanet. Because of the need to save space and energy, there can only be a limited amount of the things needed to survive. So, when things such as food, water, or fuel runs out there is no way to renew these things for the people in space. Scientists need to find a way to renew these important things and this is something that is stopping them from traveling to an exoplanet. Technology regarding the aircraft itself and a person’s health becomes a huge problem when it comes to attempting to travel to anything outside of our solar system. Earth’s atmosphere usually protects us from the solar rays and cosmic rays. In space, astronauts no longer have that protection, so it’s important that the deeper we are into space the better protection we have to protect our technology and our astronauts. The problem that they face presently is the fact that statistically, a week in space’s cosmic ray environment will shorten an astronaut’s life by about a day. We can only guess how much shorter someone’s life will be with a generation of people needing to be in space for 142,000 years. The cosmic rays during the trip to an exoplanet would do serious damage to most of our technology presently because of the high energies coming off of cosmic rays, especially if we would need to go to a quicker speed than ever before. Scientists do not yet know whether or not the deeper depths of space hold high energy rays or low energy rays. There is no real way to detect the energy of the rays that are in the path of traveling to an exoplanet.Therefore, it is quite difficult to know what they are actually preparing for when building an aircraft for an area not as well known. Whatever the energy of the rays are the technology still needs to be able to withstand these high amounts of cosmic rays for a distance that is almost 4.42 light years away. Our spacecrafts that we have aren’t able to withstand cosmic rays for this long amount of time and distance. There are ideas to advance this technology such as using hydrogen- rich plastics or adding an extra sheet of metal or aluminum on the aircraft. There are ideas such that they would build the metal on an aircraft thicker but this still will make the actual craft heavier, and it wouldn’t be much of any help because metal can’t withstand high cosmic rays for a long period of time. In addition, it is believed that this would cause an increase to secondary radiation and cause an increase to the risk of radiation depending on the energy source itself. The longer scientists take to figure out a plan to advance the technology for space travel, the longer it will take for there to be a real mission to an exoplanet in the deeper depths of space, unfortunately. When attempting to travel outside of our solar system to an exoplanet, there is so much time, money, and brainpower that needs to go into it. There are so many things that needs to be fixed before any expedition to space can happen. There are things such as the lives of people, the cosmic rays’ power in space, the fact that we can’t renew valuable resources, and the power of current technology that goes into it. Scientists still are thinking about ways to improve these things, so that maybe one day there will be successful mission to our nearest exoplanet. As the Sun gets older and older Earth gets hotter and hotter because the Sun becomes more luminous. If humans were able to go back in time they will find that the Sun will get fainter resulting in a much colder Earth. Imagine Earth, a huge ice ball rotating through space, many scientists believe that is how things were. The Faint Young Sun paradox describes the contradiction between observations of liquid water being found in the Earth’s early history and the expectation that the Sun’s output would be only 70% as intense during that era as it is today. The reduction in the amount of light radiated by the Sun resulted in a loss of heat felt on the Earth, which was not enough for life to flourish. Any liquid exposed to the Earth’s cold surface would freeze, but that could not have been the case because geological records show existence of liquid water in rocks over 4 billion years ago! This conundrum still puzzles leading scientists. The only possible solutions are if greenhouse gases on Earth were higher in the past than they are now, or if the Earth had a much thicker atmosphere. Read on for more information! The x-axis on the graph below is the Earth’s age; beginning at 4.5 billion years ago and ending today. 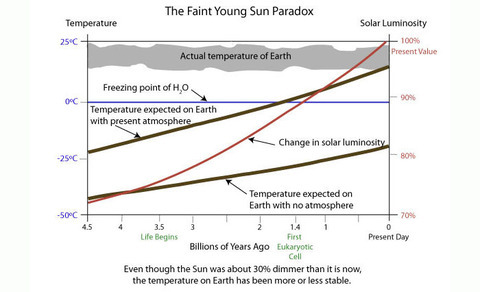 The y- axis on this graph (left) is the temperature on Earth, and the y-axis (right) is the solar luminosity. You can see that as you go back in the time the Sun was less bright; the red line represents this. The blue horizontal line represents the freezing point of H2O on Earth (which is 0 degrees Celsius). The brown lines predict Earth’s temperature based on its current atmosphere (top brown line) and Earth’s temperature without any atmosphere (bottom brown line). Notice how as the solar luminosity increases so do the temperature on Earth with/ without an atmosphere. As seen on the graph the brown lines are below freezing for several billion years in Earth’s early history. However, geologists concluded that the temperature on Earth was always warm enough to host life because rocks show unique signatures of water and heat exposure , the grey area shows the measured temperature using these rocks’ signatures (geologists rock at this type of work!). So the data presented (grey area) doesn’t match the predictions made by scientists (brown lines). How is this possible? Possible solutions to this paradox are that Earth had either better greenhouses gases or a thicker atmosphere in the past, which both could have drastically increased Earth’s temperature. Greenhouse gases are gases in the atmosphere that absorb radiation within the thermal infrared range (heat). One can think of greenhouse gases like a blanket, one’s body heat (Earth’s heat from the Sun) gets trapped in the blanket (atmosphere) and does not escape. But some blankets do a better job at warming than others, right? Greenhouse gases work the same way! Both Carbon dioxide and methane are great examples. It takes more CO2 to warm the Earth than it takes methane. Using 10 cotton blankets (CO2) will be the same as using one fleece one (methane)! So Earth could have had a thicker atmosphere (10 blankets) or just one full of better greenhouse gases like methane (fleece). If Earth had a thicker atmosphere or better greenhouse gases in the past, geologists have predicted that it could have been within the shaded range of temperatures. The Sun is growing larger and brighter today, but was once faint and young. How did liquid water possibly exist on a cold planet? Earth having a thicker atmosphere could be a possible solution, however, scientists don’t know what happened to the thick atmosphere to get the thinner atmosphere that we have today. No one will ever know what happened… unless we develop a time machine and go back in time, which could be cool.